LUDHIANA, Punjab (August 4, 2015)—Senior Supreme Court lawyer and Aam Aadmi Party (AAP) leader Advocate HS Phoolka slammed the Punjab government for not allowing anyone to meet Bapu Surat Singh Khalsa, who is on a fast unto death since January 16 for the release of Sikh political prisoners, and admitted in DMC hospital here. Phoolka was also not allowed to meet Bapu Surat Singh. 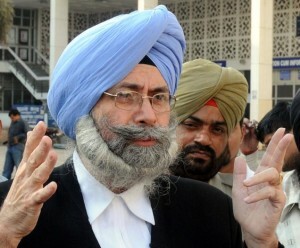 Talking to media persons, Advocate Phoolka said that the case regarding the right of union and state government in releasing prisoners was still pending in Supreme Court. He said the union government had submitted its plea in Supreme Court that the states had no right to release the prisoners who have completed their terms which is totally unfair. “Doing so, the union government is snatching the rights of the states. Other state governments have taken services of senior lawyers to strengthen their side but Punjab government is silent over it. It shows that Punjab government is surrendering itself before the centre government”, he said.